When it comes to visiting the metropolitan area of the Twin Cities, of Minneapolis and St. Paul, tourists and residents alike can expect a relatively easy and quick commute, even in the busiest and most populated areas, especially when compared to places in the United States where the traffic is truly terrible, like Los Angeles or New York City. The rush hour in Minneapolis and St. Paul tends to be a concentrated in the traditional rush hour times of early morning and afternoon: the morning rush hour is the worst around 7:30 to 8:30 a.m., while the evening rush hour starts relatively early, at around 4 p.m., and peaks at 5 to 5:30 p.m.
Traffic leaving the downtown area and heading toward the suburbs persists longer than rush hour in the cities. However, apart from rush hour, it's not very common to see congestion on the roads in the Twin Cities, other than the kind you would expect around a major event, during severe weather. or road construction, or heading out of town on a holiday weekend. The busiest roads in the Twin Cities metropolitan area are the ones bringing commuters in from the northwest, west, and southern suburbs. All the major freeways—Interstate 35 and the I-35E and I-35W branches, I-94 and the I-494, the I-694 beltway roads, and the spur road I-394—get predictably congested. 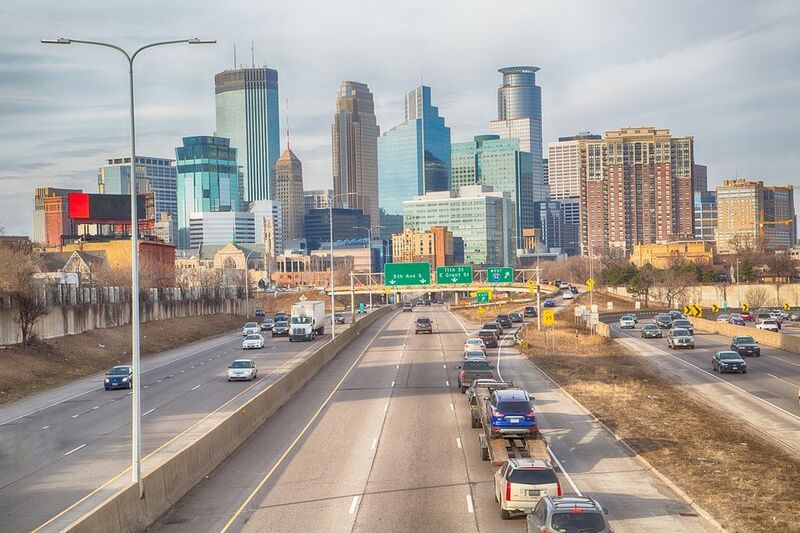 The intersection of I-35W and Highway 62 in south Minneapolis is a notorious hotspot for traffic congestion, and the section of the I-35W south of downtown Minneapolis is the busiest section of freeway in Minnesota. I-94 between downtown Minneapolis and St. Paul, most of I-394, I-35W leading into downtown Minneapolis, and I-35 around downtown St. Paul all have very heavy traffic during rush hour. Often, the best way to avoid local traffic during heavily congested times on these major roadways is to take the city streets instead of the freeways and highways. However, the downtown sections of both Minneapolis and St. Paul can get just as congested as the major roadways during the peak of morning and evening rush hour. As well as sheer numbers of vehicles, congestion is exacerbated by seasonal factors and construction projects that result from daily wear and tear on the roadways. In the summer, MNDoT liberally distributes traffic cones all over the Twin Cities and tries to do six months' worth of road construction and repairs during the warmest months. Potholes are another hazard in the spring because the spring freeze-thaw cycle generates serious potholes on the roads and freeways. Although these do not significantly increase traffic on their own, the resulting patchwork in late spring and throughout the summer can cause lane and road closures that can add time to your commute. In the winter, there's no more roadwork to slow you down, but many people who bike or ride the bus in the summer are back in their cars, and the weather often makes traffic worse. The region has serious snowstorms and icy roads that can make driving a headache or impossible. Additionally, there are many more accidents when roads are snow-covered or icy, and if you are attempting to drive in those conditions, you are almost certainly going to experience delays. What Are the Options for Removing Leaves in Minneapolis and St. Paul?